Visual culture is the aspect of human culture that is created and expressed in visual images. Visual ecology is the study of how animals, including humans, use visual systems to meet their ecological needs, how these systems have evolved, and how they are specialized for particular visual tasks. This highlights the fundamental importance of visual culture in defining the human ecological niche. Human visual ecology is therefore the study of the visual relationship and interactions between humans and their environment. It considers the ecological, evolutionary, historical and socio-political dimensions of different people’s engagement with each other and their surrounding environment using visual media. Not the least of these interactions is discovering the visual beauty of environmental mysteries. “Insofar as we live in a culture whose technological advances abet the production and dissemination of such images at a hitherto unimagined level, it is necessary to focus on how they work and what they do, rather than move past them too quickly to the ideas they represent or the reality they purport to depict. In so doing, we necessarily have to ask questions about … technological mediations and extensions of visual experience”. Digital technology has certainly produced a radical change in the conditions of visuality and the subsequent transformation of a person’s perception of the world into images. Digital images now enfold people in their domestic and wider social environments. In this sense they are an increasingly powerful component defining the human ecological niche. They now participate in the making of mental worlds and have become forms of thought constituting a new kind of knowledge, one that is grounded in visual communication and thereby dependent on perception, demanding the development of the optical mind. Seeing puts things in the mind’s eye and casts a particular power over place. In particular, it reveals the hidden, conveys precision and offers control to the observing eye. This is why overhead satellite imagery and drone cameras are now closely associated with scientific and managerial approaches to the environment. In this sense digital imagery engages the eye with new visual experiences aimed to promote a holistic meaning or message. A collection of pictures deliberately assembled by an individual, may be thought of as a ‘data island’ whether or not it defines a real island. The brain starts to make sense of it, attempting to turn the images into a pattern, trying to construct a reality from the pictorial signals available to it. From this angle, John Gillis argues that real islands have played an essential role in Western culture, which “not only thinks about islands, but thinks with them” Islands are distinct worlds, miniatures of large communities where different issues are closely related to one another, in which it is easier to recognize the links between culture, economy, society and nature in contexts of insularity, The important thing is that islands of knowledge enter the minds of most people through collections of pictures. Understanding a small island community is not easy, whether it is your own, a collaborating island or one that you only visit. The long standing complex relationship between islands and fiction writing illuminates some of the seemingly infinite connections between the mind and the environment which, like gradually eroding strata on a sea cliff, continue to unfold before us and yield new treasures. The plethora of such images has promoted the artfulness in people. An example is Sarah Nordean’s ‘The Islands’, which could be seen as a collection of these sorts of mental maps. Relationships between objects are not always geographic relationships of measured direction and distance. A memory of a flower or a broken down wall can be as important as the weave of a streambed. 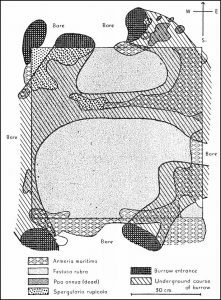 This blog concentrates on the role of digital imagery in the analysis of surface topography to generate an interdisciplinary understanding. Geographical places and their physical features are sites of remembering, where landscape operates as a storehouse for personal and collective memory. The artist Kazimir Malevich (1878-1935), who wrote extensively on the aesthetics and philosophy of modern art, identified the aerial landscape (especially the “bird’s-eye view”, looking straight down, as opposed to an oblique angle) as a genuinely new and radicalising paradigm in art of the twentieth century. In his view, air travel, and more specifically, aerial photography had created this broad change in scenic consciousness. The Italian Futurists were similarly fascinated with aerial views of landscapes. Unlike traditional landscapes, aerial landscapes often do not include any view of a horizon or sky, nor in such cases is there any recession of the view into an infinite distance. Additionally, there is a natural kinship between aerial landscape painting and abstract painting, not only because familiar objects are sometimes difficult to recognize when viewed aerially, but because there is no natural “up” or “down” orientation in the painting.. 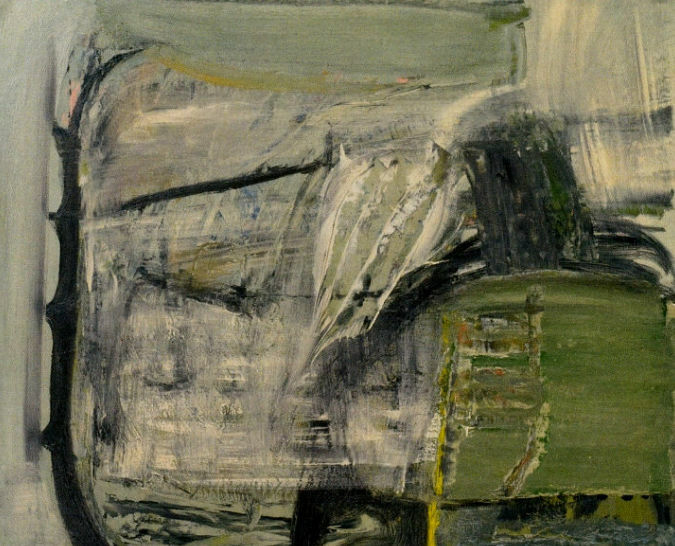 The Cornish painter and glider pilot, Peter Lanyon, imagines being hundreds of feet above the Penwith Peninsula as a bird, wings spread, with wisps of cloud, and fields and hedges far below represented in a style that straddles the figurative and the abstract (Fig 1). Another interpretation of this painting is that it encapsulates a body of interdisciplinary knowledge about Cornish cultural ecology of the lands to the south of St Ives. It is only recently that science and art have come together in the presentation and analysis of the surface landscape. The methodology and evidence is that of aerial survey. The first aerial photograph to obtain geographical information was taken of a French village and its surroundings in the late 19th century. The man who took the picture was photographer Gaspar Felix Tournachon. He patented the concept of using aerial photographs to compile maps. The invention was to prove much more effective than the time-consuming ground surveys that had then been used by national mapping organisations that developed throughout the 19th century. George R. Lawrence took aerial photographs of San Francisco in 1906 following the devastating earthquake, but it was not until World War I, when potentially military applications were foreseen, that a systematic process of taking aerial photographs would become key to the development of the photographic method for obtaining environmental information. 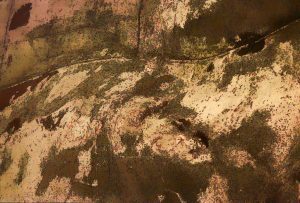 Science meets up with art in digital technology when an artwork is produced from an aerial photograph taken in an ecological survey. (Fig 2). Archaeology has gained the most from the application of aerial survey to reveal buried remains of earthworks and buildings, but there have been few collaborations between archaeologists and ecologists in understanding the common ground between the two professions. One such collaboration was initiated in the 1980s, when biologist Denis Bellamy and archaeologist John Evans explored the the impact of prehistoric farmers in the creation of the fixed point ecological microcosms we see today. The site was Skomer, a small offshore island in West Wales, which in prehistoric times had been home to a small number of farming families, A commonplace ‘Galapagos’ dignified by its outstanding sea bird colonies and a subspecies of the mainland bank vole. 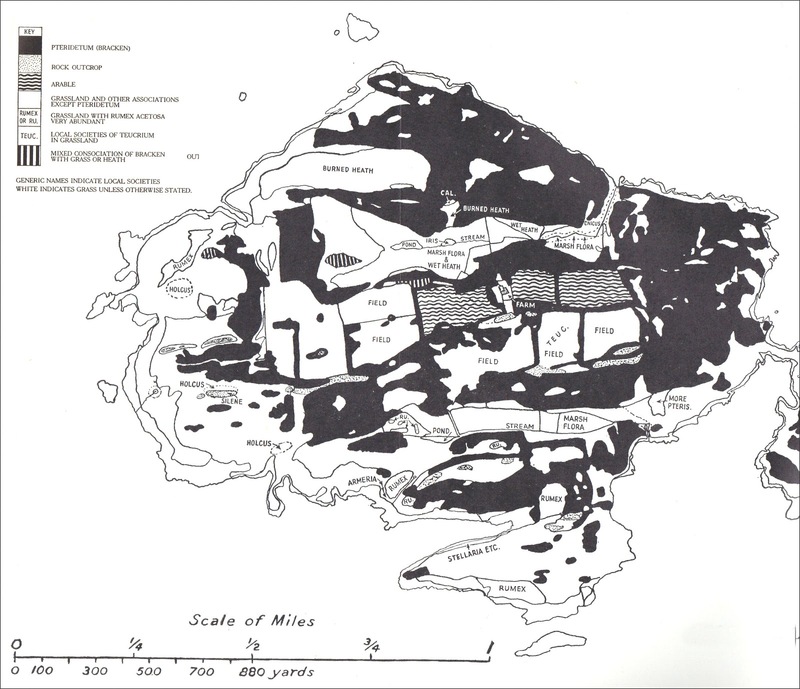 The first farmers divided up the island with a system of stone walls interlocking with low narrow outcrops of volcanic strata. The remains of their activities provide a sense of the visual language required to explore the environmental dilemmas at the heart of our globalized world. They are the things we have left behind. As part of our visual culture they tell us that everything we do to survive leaves an imprint on the land. Edward Burtynsky is one of a modern generation of photographers who use aerial images to seek to portray the visible outcomes of a globalized economy and humankind’s impact on environments around the world. The Burtynsky visual perspective tells us although we have moved on from the old words to the new ages: the Information Age and the Biological Age of nature conservation , the Stone Age and the Iron Age and the Copper Age are all alive and well, and expanding manufactured landscapes on a scale that from a bird’s eye view is visually breathtaking. In describing the message of his images Burtynsky says it’s like our consciousness is forging ahead into the new world. He thinks that it’s those old worlds that can come up from behind us and undercut our ambition. As the largest terrestrial ecosystem on Earth, grassland is associated closely with many of the most challenging environmental and ecological problems that humankind will face during the next several decades at a global scale. These include desertification, land degradation, climate change and loss of biodiversity. It is vitally important that better long term temporal inventories are obtained of grassland and that improved surveillance and monitoring with relative accuracy takes place, so that sustainable, long term grassland management is achieved. However, due to its great expanse and diversity, rapid and low-cost evaluation and management techniques are required. For this reason, remote sensing technology provides a powerful tool for producing an inventory, managing it and monitoring outcomes. Remote sensing has been recommended for at least 30 years for use in the management of grassland resources on a worldwide basis. The first black and white aerial photography became available for investigating grassland as a resource in 1935. Remote sensing developed into a science in the mid to late 1960. The launch of Landsat 1 in 1972 ushered in a new era extending remote sensing beyond air photo interpretation into the realm of digital analysis of multispectral and multitemporal data. A literature survey shows that 407 papers on grassland remote sensing were recorded by CABI information database from 1995 to 1999. The application of remote sensing technology covers land classification and changes in grassland-use, grassland productivity-assessment, conservation and recreation, detection and monitoring of stress caused by fire, drought and pests. Today, remote sensing, along with Geographic Information Systems (GIS) and Global Positioning Systems (GPS) have provided a powerful and sophisticated approach to the utilization, development and management of grassland resources throughout the world. Fig 3. 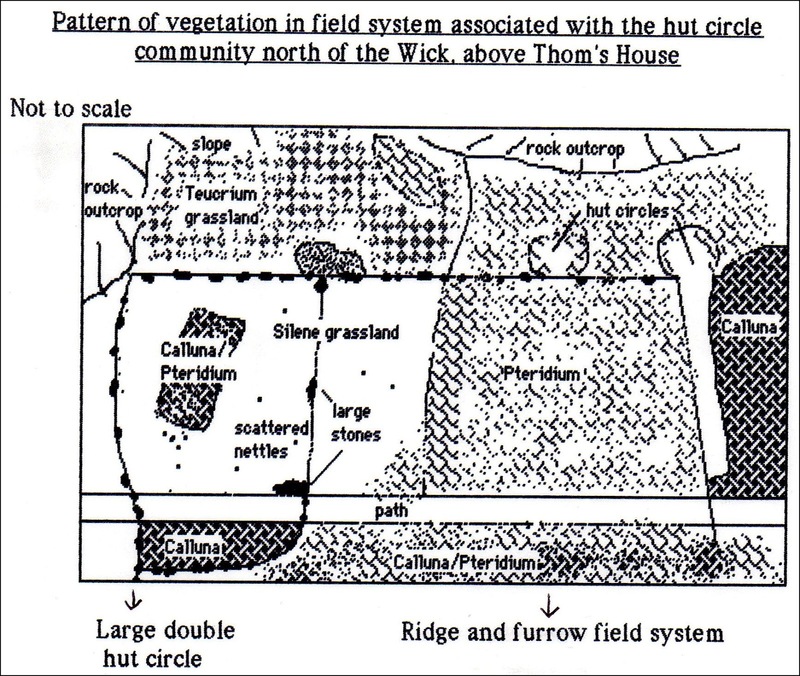 The relationship of ungrazed vegetation to the underlying burrows. Rabbit-proof enclosure, N.E. Skokholm, July 1953 (Giillham, 1956). Gillham’s research was mainly concerned with the impact on vegetation of the faecal nutrients from nesting colonial seabirds. Although only a mile away along the coast from Skomer, the island of Skokholm is more exposed to South Westerly air flows and is like a promenade regarding the impact of gale driven waves and salt spray. In this respect, Skomer although only two miles away to the South has sheltered valleys and rocky outcrops and therefore responds to weather variations in more diverse ways. 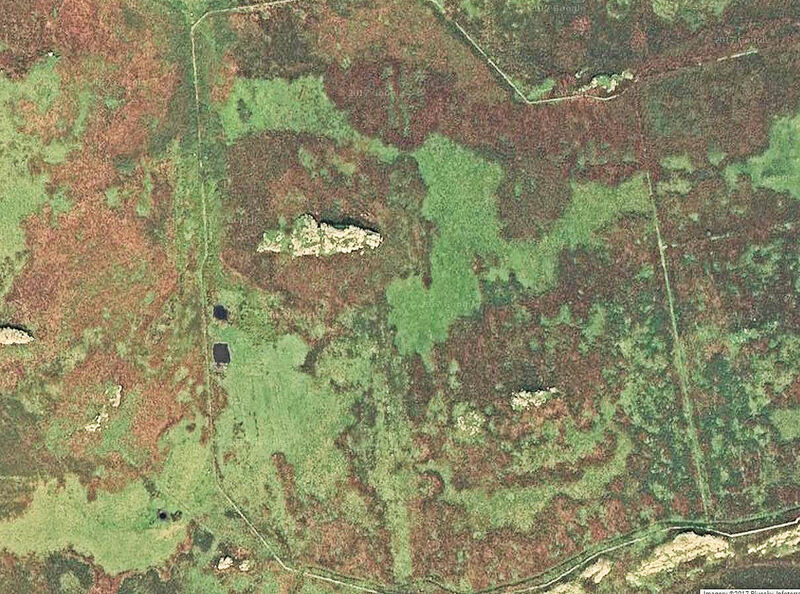 The vegetation of Skomer Island was first surveyed on the ground by J Sadd and presented as a bird’s eye view of the surface of the island in 1947. 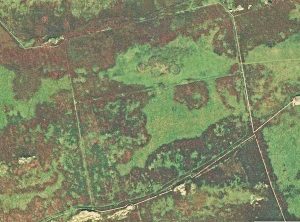 The map makes a scientific statement that the ground cover was about equally shared between sub maritime grassland and dense stands of bracken with a scattering of small areas of heather heath (Fig 4). From the mapped distribution of these habitats bracken seems to be more dominant in the north east of the island with grassland more common in the south west. A glance at the current Google satellite image suggests that the distribution of these two habitat features has changed little in the last 70 years (Fig 5). 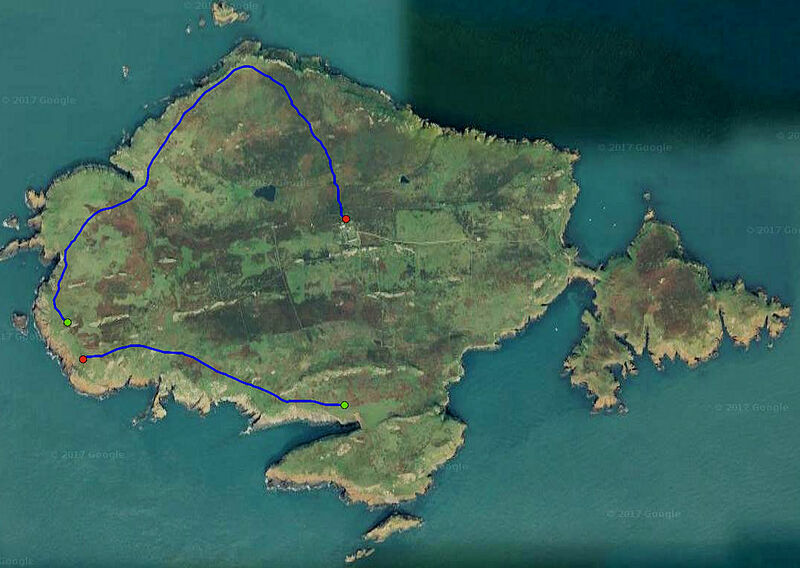 The positions of the bracken areas are controlled by shelter from south westerly winds. Within a global context, the treeless island of Skomer is currently classed as a Western Eurasian Thicket, maintained dynamically by a combination of south westerly maritime air flows and heavy rabbit grazing. In the classification of Palaearctic habitats Skomer may be described holistically at the present time as an arrested succession towards Atlantic Blackthorn/Bramble Scrub. The bìg question is how bracken heath and grassland have coexisted in a dynamic equilibrium for such a long time without management. This question will be answered through long term aerial surveillance of the vegetation patchwork to assess the stability of patch boundaries and the life strategies of the plant species in border microcosms. 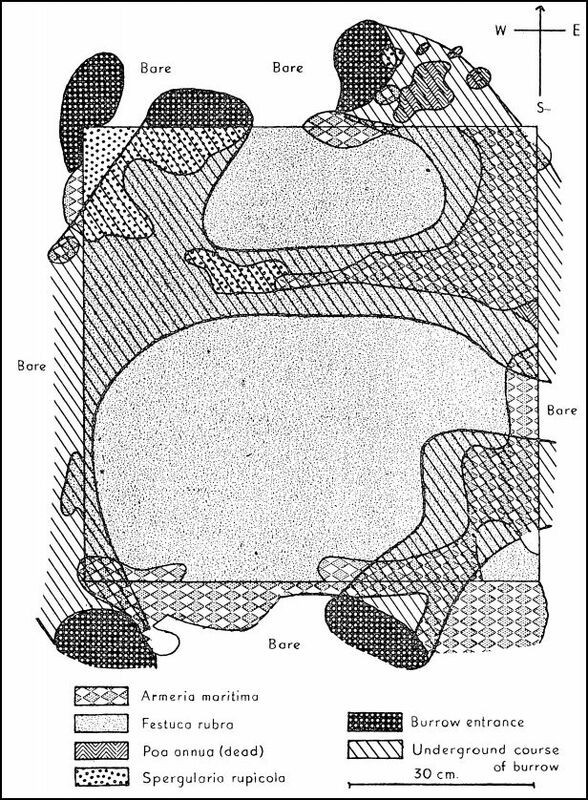 The ecological compartmented microcosms have been simplified to produce a map of 20 topographical divisions for locating observations and projects (Fig 6). In the centre of the island these divisions coincide with the fields laid out in the 19th century to create a ‘modern’ farm linked with the mainland economy. At the time of Sadd’s survey the commercial farming enterprise was utilising the central fields to grow early potatoes for the mainland market. This venture provides a baseline of zero biodiversity for at least three of the fields (compartments 4,5, 6, & 18) from which their present wildness has developed over the following six to seven decades. It is probably significant that Sadd records areas of burnt heath north of the farm. This is indicative of management of heather for livestock grazing. 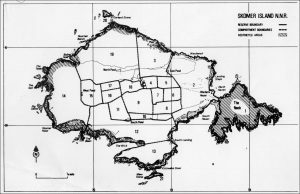 It is known that cattle grazed the outer regions of the island at this time, and Sadd mentions there were also sheep and goats. Walking round the island today, it doesn’t take long to recognise that some of the local botanical patchwork is related to geological features. Persistent grassland often occurs in the immediate vicinity of rock outcrops. It also becomes clear that human activity has produced subtle ecological patterns and that some of the impacts have been transient. The was the case for Compartment 8 in the 1970s, where grassland managed with ridge and furrow had been colonised by heather. It flourished along the ridges but was absent from the troughs. Over the next decade or so the heather was displaced by bracken, a trend that instigated a management reaction aimed at protecting the incipient heathland from rabbits. Rabbits, were introduced by the Norman lords of Haverford West as a commercial enterprise to produce meat and fur and every part of the island is now dominated by rabbit grazing. Rabbits are not managed and their impact is assessed by establishing fenced exclosures. Today one often comes across ecological differences across man-made boundaries, recorded as the loss of species or changes in their relative density (Fig 7). There are patches of nettles alongside hut circles. Scatterings of nettles are also found in some small prehistoric fields. Nettles are evidence of soil phosphate, which originates from waste disposal and livestock dung. Are these the outcomes of the behaviour of prehistoric farmers that have persisted as local differences in soil chemistry for thousands of years? 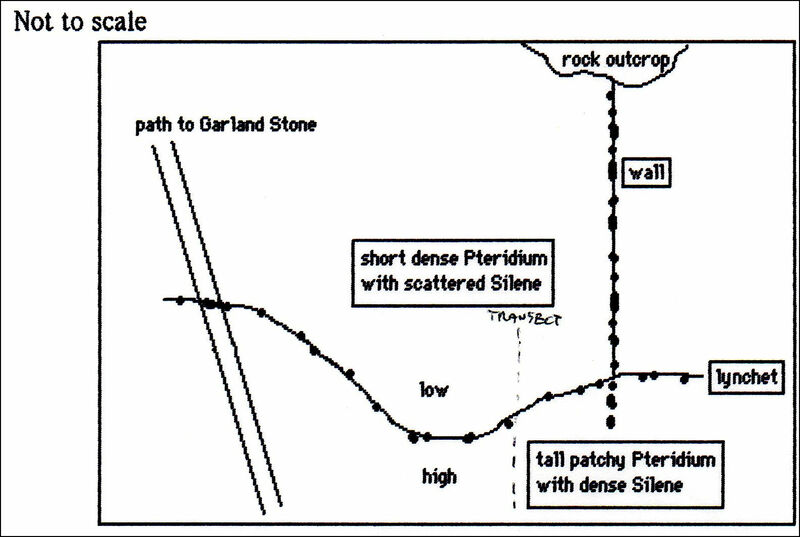 In the 1980s good examples of small scale patchworks could be observed in Compartment 12 (Fig 8). Regarding ground truthing, the National Vegetation Classification (NVC) is one of the key common standards developed for nature conservation agencies that takes a macrocosm view of botanical diversity. The original project was initiated to produce a comprehensive classification and description of the plant communities of Britain, each systematically named and arranged and with standardised descriptions for each. It was originally commissioned in 1975 by the Nature Conservancy Council (NCC) and was intended as a new classification, not an attempt to fit British plant communities into some existing scheme derived from elsewhere in Europe. The general approach adopted was phytosociological and, therefore, concentrated on the rigorous recording of floristic data. It did, nevertheless, try to avoid over-scrupulous selection of samples, rejection of awkward data and preoccupation with the hierarchical taxonomy of vegetation types Quadrats are used to collect data on the abundance and frequency of each plant species. This information is then analysed using NVC community/sub-community descriptions. Each NVC habitat type then uniquely defines a macrocosm as a particular statistical combination of frequency and abundance values. 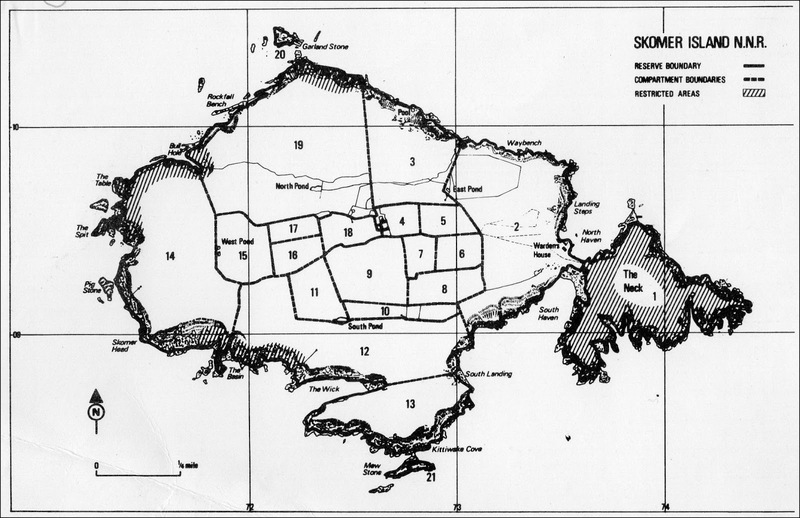 A quadrat-based approach was applied to survey Skomer’s vegetation in 1979 based on a random distribution of 270 sampling sites of which 90 were made permanent. The plants common to this survey are listed in Table 1. The results did not fit any of the NVC categories, which was to be expected because there was no rejection of awkward data and the averages do not match the obvious patchwork perceived visually as local high levels of diversity produced by the activities of rabbits. In 1998, 76 of the quadrats were re-surveyed for the six main species and 13 were analysed in 2015. Due to time constraints and the fact that the position of most plots is unknown, only 13 were surveyed in 2015. Much time was spent searching for the plot markers. Because of the small numbers of quadrats that were actually found no firm conclusions were possible regarding temporal trends in species abundance. This testifies to the futility of trying to organise long term surveillance by positioning quadrats on a map without precise grid references that can be readily re-visited. Therefore, there is only anecdotal evidence as to long term changes in the surface landscape. In this context, there has been a great loss of maritime heath. Up until the last farming episode on Skomer in the 1940-50s maritime heath had been maintained by a combination of grazing, probably by sheep, and periodic burning. These operations were likely to have been managed at relatively low densities of culled rabbits, which had always been controlled by owners and tenants by shooting and trapping them. 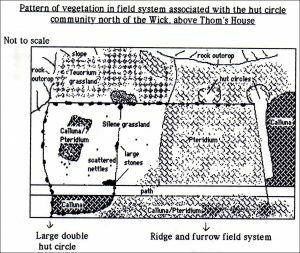 Sadd only mentions the impact of rabbits when he described Compartment 9, which was definitely not grazed by farm livestock. The abolition of the livestock production system and the banning of rabbit culling when the island became a nature reserve could have been responsible for the gradual loss of heathland. Uncut heather has a relatively short lifespan, It is possible that in recent years climate change may also have played a part in its degeneration. From the Stockholm conference on sustainable development to Rio +20, the term “Nature” rarely features in the international discourse outlining strategies for limiting the damages to the environment while promoting economic development. This is not simply a matter of semantics. The World Charter for Nature, [Adopted by the General Assembly October 1982] and the Universal Declaration of the Rights of Mother Earth [Adopted by the World People’s Conference on Climate Change and the Rights of Mother Earth in Bolivia in 2010] are ignored in the Declarations of the subsequent , respective World Summits on the Environment and Sustainable Development. We really do need to give more weight to the concept of ‘Harmony with Nature’ in the debates on sustainable development. The neglect of “Nature” is at the core of many problems with which we are confronted. A shift of emphasis in our policies and actions to give greater attention to “Nature,” rather than environment, as such, would give humankind a better holistic ecological strategy of survival. There are two political world views on the relations between humankind and the natural world. One conceives humanity apart, as the steward or master of the “environment.” The other begins with Nature and its visible and invisible manifestations, including humanity. To approach Harmony with Nature it is imperative to consult other relevant sources of knowledge including philosophy, the arts and religion as well as the physical and social sciences, which currently monopolize the political focus on the “environment,” and how to sustainably develop it. There are concrete examples of working in harmony with nature that demonstrate the practicality as well as the benefits of considering nature, itself, as an imperative focus of political thinking and action. The Triglav Circle was established to pursue the discourse begun in the United Nations Seminar on Ethical and Spiritual Dimensions of Social Progress held in Bled, Slovenia, October 1994. The seminar was a step in preparation for the World Summit for Social Development held in Copenhagen, March 1995. In January 1996, nine of the Seminar participants drew up a constitution for the Triglav Circle. Triglav is the name of the mountain that serves as a national symbol for Slovenia. It was at its base that the Seminar took place. Mount Triglav is the namesake of the three-headed deity who symbolised Love, Spirit, and Wisdom and was always accompanied by his noble stallion, “equus divinus.” The combined symbolism evokes solidarity, responsibility, and humility in the pursuit of a harmonious world community in which ecophilia, love of nature, is at the centre of action. In other words, the love and pleasure of nature instills a fellow-feeling. The American entomologist Edward 0. Wilson calls this inherent love of all living things ‘biophilia..
We are committed to a political, economic, ethical, and spiritual vision for social development that is based on human dignity, human rights, equality, respect, democracy, mutual responsibility and cooperation, and full respect for various religious and ethical values and cultural backgrounds of people. Since the times of the ancient Egyptians, and before, culture and its relationships to the local environment were a means to give hope to humankind with reassurances, through rituals and rites, about death and the separation from life and its benevolent resources. 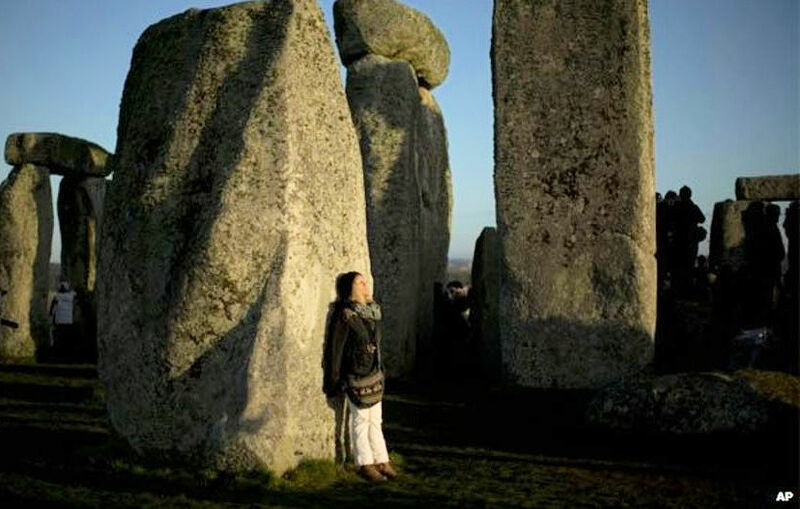 Civilizations developed harvest rites in order to honour the Earth: these rites have not only ecological and economic benefits, but also psychological ones. By working with symbols and re-enactments to support fantasies of immortality, people create a psychic phenomenon that comforts them. Moreover, cultural norms, delivered through the rites of passage and rituals, allow human beings to put a distance between themselves and topics too painful to deal with at an individual level, such as death and separation. By providing rules for responding to these ecological situations, culture both protects and heals; it has the ability to connect with our deepest emotions. Love of nature is a response originating in an attachment to place. From the Amazonian Yanomami, to the Arctic Inuits and the Namibian San, and even for people in urban areas, deep down we all harbour feelings of belonging to “a land”, and belonging to “the land”. Indeed, attachment to a place, to a scenery, to a soil that has nurtured people for generations, is one of the contributors to our sense of safety and our psychological stability. This need for a locus to lean on is vital to human existence. Such has been the role of Skomer from prehistory. In modern tunes, the eco-activist and Nobel Prize recipient Wangari Maathai was among the most audible voices arguing for a reconsideration of nature as a concept deserving dignity and respect, and retribution. Personifying nature, Maathai seems to be calling for a broader perspective on ecological issues, going beyond the traditional economic worries. She underlines the fight for our humanity and what exactly makes us human, through the fight for nature. 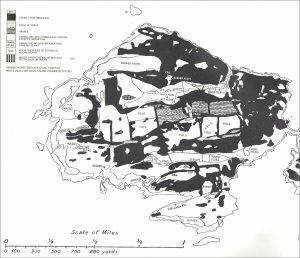 These issues emerge on Skomer because of the intensive use of the surface of the island as a home for a few prehistoric families immersed, from time to time, in the island’s ecosystem, where the topography must have penetrated their primitive religion. Hence the island has a bearing on the concept of Mother Nature. In a sense we owe it to these ancient Skomer families to consider their legacy of deep ecology. Primitive religion is a name given to the dimly understood religious beliefs and practices of those traditional small and, often isolated, preliterate cultures that helped equilibrate them with their limited ecological resources. They have not developed urban and technologically sophisticated forms of society, but the term does not mean that the religions of those peoples are somehow less complex or less effective than the religions of “advanced” societies. In fact, research carried out among the indigenous peoples of Oceania, the Americas, and sub Saharan Africa have revealed rich and very complex religions, which organize the smallest ecological details of food gathering and reproduction through which Nature, as Mother, governs people’s lives in harmony with the ecosystem services that support them. This is why the words ‘Mother’ and ‘Nature’, implying harmony between cultures and ecosystems, is the ancient Skomerian’s legacy for introduction into the relevant debates and texts produced for sustainable development by the international community. Surface conditions on Skomer have been, for most of its geological time, produced by life, This does not mean that “earth is a “life form” in the sense of a self regulating entity of the Gaia Hypothesis. The Gaia Hypothesis is incorrect. Organisms do not manipulate deliberately the biophysical systems of which they are a part so they can support them. Life is produced by natural selection, by the competition between individuals for reproductive success. Evolution has no goal of making Earth a better place for life. Earth was not produced by natural selection, and hence it is not itself a living thing. Nevertheless, Gaia in its original context in Greek mythology, Gaia also spelled Gaea, is the personification of the Earth as one of the Greek primordial deities is an example of the prehistoric idea of an ancestral mother of all life: the primal Mother Earth. Are we right to think that the first human inhabitants of Skomer brought this idea with them to this small, prosaic Galapagos? There is no doubt that stones are common global resources for spiritual journeys. In this context, stones are rocks used for a particular purpose, such as altar stones and foundation stones, and are given individual names like Stonehenge (Fig 11). There are three such named stones on Skomer; the Garland Stone, the Mew Stone, and the Pig Stone. All three lie a few metres off shore. Seeking spirituality is a common behavior these days. It is a way of stepping beyond religious divides. To others without religion it is nothing so esoteric. Instead, it is simply reacting to a “feeling” that there must be ‘something else’. Science has replaced God for many today, but while science may be able to explain the working of a material world, it doesn’t evoke how many people feel about their emotional place in nature. Awe and wonder is how these people often describe their positive relationship with the world. There’s a sense that life is more than dollars, work, childcare and the rest of the daily grind. There are moments that seem transcendent; a beautiful sunset, a football crowd filling a stadium with noise, or a moving piece of music. The experience triggers something within that has evolved to enable humanity to become one with the environment. This feeling of oneness is what most would define as a spiritual experience. In this context, stones, large and small, are often used as spiritual triggers. Among archeologists a view is growing that the first peoples on Skomer were part of the culture of the New Stone Age (Neolithic) that focused feelings of spirituality on stones; a movement that eventually carried the local bluestones of the Preceli Hills to Stonehenge. The modern visitor’s first impression of Skomer is that it is a special rocky realm. Visually it is quite distinct from the mainland landscape. Its narrow parallel ridges of lichen-clad rocks make a dramatic scenic impact that follows the visitor round the island and gives Skomer a distinctive air of ‘otherworldliness’. On a misty day even someone who knows the island well can lose their bearings. In this sense a visitor can share a basic visual impact that must have struck the first prehistoric farmers and singled out the island as a special place. Skomer’s rocks are unique and are thought to have been extruded as a series of lava flows spread out onto the seabed. 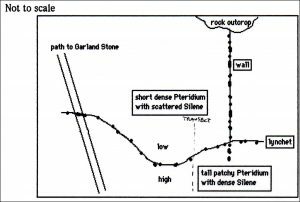 They were laid down horizontally as a geological multilayered sandwich consisting of a large number of outflows, one on top of another, each not exceeding a few metres in thickness. From that time, the land has risen relative to the sea and the volcanic strata have been tilted in a south easterly direction at an angle of 20 to 25 degrees. It is possible that the mass of lava passed through an uplift phase where the ridges were eroded as marine reefs. Nature is an aggressor that imposes its arbitrary life-cycle on anything that gets in its way. An Aboriginal person’s inward condition produces a mind set where the spirit is believed to continue on after the physical form has passed through death. After death the spirit returns to the Dreamtime from where it will come back through birth as a human, an animal, a plant or a rock. The form is not important because each form shares the same spirit from the Dreamtime. There is a similarity of this view to that of Shinto and Buddhism,which are bound together in modern Japanese culture. Shinto (“the way of the Kami”) is the name of the formal state religion of Japan that was first used in the 6th century C.E., although the roots of the religion go back to at least the 6th century B.C.E. Shinto has no founder, no official sacred texts, and no formalized system of doctrine. It has been formative in developing uniquely Japanese attitudes and sensitivities, creating a distinct Japanese consciousness about the environment. Belief in kami, understood to be spiritual essences joining people and nature, is one of the foundations of Shinto. The spiritual messages actually originate in the observer’s brain where they can elicit feelings of awe and wonder. The kami exist as imagined beings within mountains, trees, rivers, and even geographical regions. In this sense, the kami are not like the all-powerful divine beings found in Western religion, but the abstract creative forces in nature. Related to the kami is the understanding that the Shinto followers are supposed to live in harmony and peaceful coexistence with both nature and other human beings. This has enabled Shinto to exist alongside other religious traditions. As the foundation for Japanese culture, Shinto has also played a significant role in the political realm. For centuries, Shinto religious festivals and ceremonies have become indistinguishable from the affairs of the government. It is significant in this context that it was a Japanese artist, Hiroshi Sugimoto who was inspired to make images that would have been recognizable to primitive man. In doing so, he holds up a mirror to our own identity in the present. For more than 30 years, Hiroshi Sugimoto has travelled the world photographing its seas, producing an extended meditation on the passage of time and the natural history of the earth reduced to its most basic, primordial substances: water and air. Always capturing the sea at a moment of absolute tranquility, Sugimoto has composed all the black and white photographs identically, with the horizon line precisely bifurcating each image. The repetition of this strict format reveals the uniqueness of each meeting of sea and sky, with the horizon never appearing exactly the same way twice. The photographs are romantic yet absolutely rigorous, apparently universal but exceedingly specific. By blurring the line between human history and eternity, representation and abstraction, the seascape project takes its place in the traditions of nature photography and achieves the status of a contemporary expression of the sublime. These are moments when a thing outside of ourselves reaches through us and wrenches us open to the reality of an existence ‘other than’, an existence which lies ‘beyond’. History has shown us that there are always those who wish to expand their borders to include additional territory, and those who wish to close them to preclude immigration. Walls are the inevitable outcome of these behaviours. Skomer’s drystone walling, separating family from family and crop from crop, has the power to take us back in time, to periods that were slower, less stressed, more in tune with nature and the pace of the natural world. It is with these aspects of stones in mind that we pick our way through the anatomy of neglected fields, hut circles and a ruined farmhouse; at the end it is a doleful experience which foretells our own earthly absence. Beyond the wall is the ‘waste’; a cliff-edge no-man’s-land, where sheep go to die. The first naturalist to examine Skomer described it as ‘Golgotha’, a place of bones; the remains of once alive rabbits and shearwaters. Death is everywhere but leads to life. Rocks become dust, become clay, become plant, become those that ate the plant. In the acid volcanic soils bones are rapidly recycled. Chemically, Skomer is an example of a steady state economy. Like a candle flame the island burns brightly as a dynamic equilibrium, as the elements pass through rocks, stones and living things each of which has its own half-life measured in aeons and minutes. Thinking in this way is more complex than consciousness. Consciousness is more complex than awareness. Awareness is more complex than susceptible to influence. These are all expression of time, yet where is the biochemical dividing line between the inorganic oxygen molecules in the air, and the oxygen in your blood, or the iron in the earth, and the iron in your blood? The air becomes you, and the iron, can travel in you, and leave again. When is it you, and when is it not? Are you foam, or core of wave? Serpent’s tooth, or lock of knave? Part of happy otter’s grin? Sliding down old Darwin’s stair? Of matter making up your wit? By quetzal birds, critics of rhymes? Or the book you read? Does it return to moose? Jealous like a pride of lions. You are currently browsing the Cultural Ecology blog archives for June, 2017.